"Freshwater mussels are also called shellfish, clams, bivalves, and unionids. Mussels are important to both man and the environment. Because they are filter feeders, mussels serve as natural water filters and act as indicators of water quality conditions. Freshwater mussels also serve as food for many types of animals. Alabama has one of the richest and most diverse assemblages of mussels in the world with 180 species. Approximately two-thirds of North American mussel species have been reported from Alabama. Factors such as the impoundment of rivers, channelization, pollution, modern industrialization and urban development, erosion, and siltation have significantly affected mussel populations. Almost one half of Alabama’s mussels are considered extinct, threatened, endangered, troubled, or of special concern. Proper management, protection and monitoring of the surviving native mussel resources (especially habitat) are essential to preserve this biologically diverse group." An aquatic inventory by malacologist Stuart MacGregor this summer did not reveal the presence of any mussels at the Highway 216 portion of Hurricane Creek. Since he was unable to survey the entire stream, Stuart offered the following input on the probability of specific mussels found in the area and their possible presence in the creek watershed. Alabama Moccasinshell – Medionidus acutissimus is a diminutive and easily overlooked species, and it does remain in some high quality streams in the Black Warrior system. 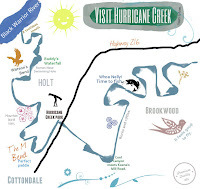 Its presence in Hurricane Creek would be surprising, but not beyond belief. Coosa Moccasinshell – While there are historic records of Medionidus parvulus in the Black Warrior system, it is conventionally regarded as occurring from the Cahaba River east. It is highly unlikely that it would be found in this area. Dark Pigtoe – The Dark Pigtoe, Pleurobema furvum, is now in synonymous with the Warrior Pigtoe, Pleurobema rubellum. It is still found in some high quality streams in Bankhead National Forest and is hanging on in low numbers in the North River system. It is possible it once occurred in the Hurricane Creek area, and its presence would be surprising, but not beyond belief. Fine-lined Pocketbook – Hamiota altilis was once considered to occupy much of the Mobile Basin along with its sister species the Orange-nacre Mucket, Hamiota perovalis. However, the Fine-lined Pocketbook is currently considered to occur from the Cahaba River east and the Orange-nacre Mucket from the Cahaba River west. Obviously there is some overlap, but anything resembling these species in the Black Warrior system would likely be considered the Orange-nacre Mucket. Flat Pigtoe – Pleurobema marshalli was restricted to large river shoals in the Tombigbee system downstream of the Fall Line and likely never occurred in Hurricane Creek or nearby. It is highly unlikely that it would be found in this area. Heavy Pigtoe – Pleurobema taitianum is another large river shoal species generally found downstream of the Fall Line, more common in the Tombigbee and Alabama rivers main channels, with one record from the Black Warrior River upstream of Tuscaloosa. Highly unlikely that it would be found in this area. Inflated Heelsplitter – Potamilus inflatus is generally found in sand or firm mud substrates, often in pools and backwaters of larger streams. 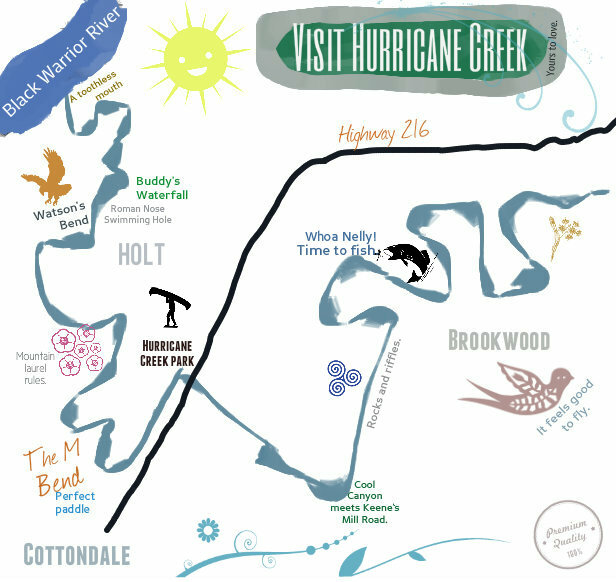 If present in Hurricane Creek, while unlikely, it would certainly be in the lower reaches near the confluence with the Black Warrior River, which does have the species present. Orange-nacre Mucket – See discussion of Fine-lined Pocketbook. Ovate Clubshell – Pleurobema perovatum historically occurred in much of the Mobile Basin and is still encountered in high quality streams. It is possible it once occurred in the Hurricane Creek area, and its presence would be surprising, but not beyond belief. Southern Clubshell – Pleurobema decisum historically occurred in much of the Mobile Basin (though rarely in the Black Warrior system) and is still encountered in high quality streams, mostly downstream of the Fall Line. It is possible it once occurred in the Hurricane Creek area, and its presence would be surprising, but not beyond belief. Stirrupshell – Quadrula stapes is another large river shoal species generally found downstream of the Fall Line, more common in the Tombigbee and Alabama rivers main channels, with one record from the lower Black Warrior River downstream of Tuscaloosa. Highly unlikely that it would be found in this area. Triangular Kidneyshell – Ptychobranchus greenii is still found in some high quality streams in Bankhead National Forest and is hanging on in low numbers in the North River system. It is possible it once occurred in the Hurricane Creek area, and its presence would be surprising, but not beyond belief. Upland Combshell – Epioblasma metastriata was known from the Black Warrior, Cahaba, and Coosa rivers upstream of the Fall Line. It is possible it once occurred in the Hurricane Creek area, but its presence would be very surprising. Explore the amazing work of the Mussel Project, located at the University of Alabama. The Alabama Dept. of Conservation & Natural Resources is notable for its dedication to educating others about mussels. RESULTS OF A SURVEY OF THE MUSSEL FAUNA AT SELECTED STATIONS IN THE BLACK WARRIOR RIVER SYSTEM, ALABAMA, 2009 A detailed report conducted by the ECO group at Alabama GSA. During the summer of 2009, sampling for federally listed and state conservation concern priority mussel species in the Black Warrior River system yielded 21 species from 16 main channel and 13 tributary stations. . Main channel collections yielded 675 live or fresh dead individuals, with the most numerically dominant and frequently encountered species Plectomerus dombeyanus, the Bankclimber, (9 stations, 28.4 collected per hour), Quadrula apiculata, the Southern Mapleleaf (11 stations, 23.8 collected per hour), and Obliquaria reflexa, the Threehorn Wartyback (11 stations, 22.0 collected per hour). The federally listed threatened species Potamilus inflatus, Inflated Heelsplitter, was collected live at two main channel stations. Fresh dead, weathered dead, and relic shells were found at a few tributary stations. A badly eroded valve of what may be Pleurobema rubellum, the Warrior Pigtoe, was collected from a tributary station. Mollusk Bibliography Database A searchable database of literature on freshwater mussels and, to a lesser extent, other freshwater mollusks. With around 14,000 references, the database covers freshwater mussels worldwide and includes paleontological literature, “gray” literature, theses, and dissertations. Maintained by Kevin Cummings (Illinois Natural History Survey), Dr. Arthur Bogan (North Carolina Museum of Natural Sciences), Dr. G. Thomas Watters (Ohio State University, Museum), and C. A. Mayer (Illinois Natural History Survey), the database is a work in progress. Users are encouraged to notify the authors of errors and omissions. Supported by a grant from the National Fish and Wildlife Foundation.